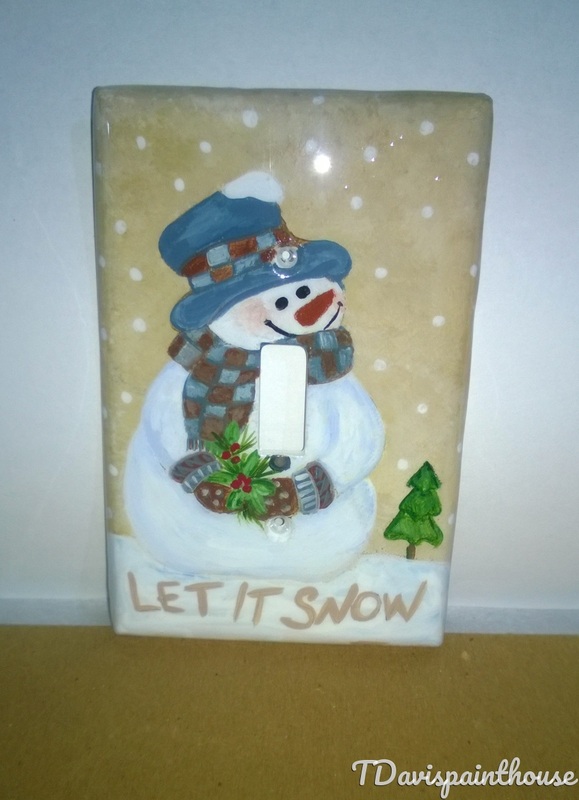 Hand Painted Holiday Switchplates featuring a well-rounded Snowman dressed in Country Plaid, Blue and Brown matching hat, scarf and gloves holding a sprig of Holly Berry leaves. "Let It Snow" is written on the bottom. Background color is tan colored. Shown here on a Single Toggle Light Switch Plate. A variety of sizes are available and are made to order upon request. Each plate is made of a nylon plastic material. The design is hand drawn and hand painted with professional grade acrylic paints and sealed with a high gloss finish to ensure durability, protection and a smooth glass-like appearance. Colors and Designs may vary slightly as products are hand painted as ordered and are not mass produced.